Offering tastefully-appointed accommodations ideal for business and leisure, the Hilton Orrington/Evanston is a sophisticated North Shore hotel with exceptional service from friendly, multi-lingual staff. This convenient Evanston hotel is situated near Northwestern University and just an "L" and/or Metra ride from the vibrant attractions of Chicago. Weekend getaways and business travelers will find a haven of comfort at Hilton Orrington/Evanston. 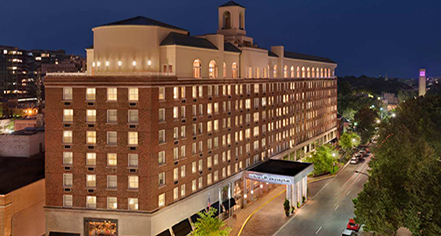 With amenities like complimentary high-speed Internet access, a full fitness center, 24-hour self-serve business center, a new conference center affording 12,000 sq ft of flexible venues, and valet parking, this historic North Shore hotel ensures the satisfaction of every guest. In addition, the vibrant community of Evanston is right outside the hotel, offering great restaurants, shopping, and cultural attractions. 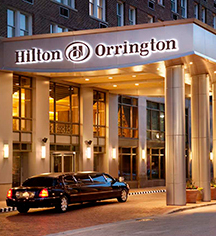 Hilton Orrington, a member of Historic Hotels Worldwide since 2015, dates back to 1923. The hotel was named in honor of Orrington Lunt, well-known philanthropist and co-founder of Northwestern University. Cancellation Policy: 24 hour cancellation, one night room charge. Cribs and Pack-in-Plays: Available upon request; complimentary. Deposit: Credit card required to hold reservation. Early Check-In/Late Check-Out: Early Departure Fee: Based on minimum stay restrictions. Late Check-Out Fee: $75.00 Late check out fee after 3:00 PM. Extra Person Fees: No additional fee. Hotel/Resort Fees & Taxes: Taxes: 11.5%. Payment: All forms of payment are accepted. Payment is required at time of booking. Visa, MasterCard, Amex, Diners Club, China Union Pay, JCB, and Discover are accepted. Pet Policy: Service animals allowed: Yes. Pets allowed: Yes. Deposit: $75.00 (Non-Refundable). Maximum Weight: 50 lbs. Smoking Policy: Non-Smoking. A fee of up to $250 USD will be assessed for smoking in a non-smoking room. Please ask the Front Desk for locations of designated outdoor smoking areas. Transportation: Limo or Town Car service available. Offering tastefully-appointed accommodations ideal for business and leisure, the Hilton Orrington/Evanston is a sophisticated North Shore hotel with exceptional service from friendly, multi-lingual staff. Learn more about the History of Hilton Orrington/Evanston .